This beautiful car came up for sale in 2009 and generated a lot of interest because it was the first 'real' performance Corvette. The car had come up for sale after Daytona and racing legend Henry 'Smokey' Yunick's widow ringing a friend to say I have some stuff here you might want. And some amazing 'stuff' it turned out to be. After a year of really going for it Steve Tate, with a small team of friends, rebuilt this great car. It was 1955 when Zora Arkus Duntov at Chevrolet Engineering was handed the car to get ready for a high speed run. A year before the car had been used by the Chevrolet Chief Engineer Mauri Rose as a test 'mule' and so had an experimental V8 put in by Smokey. To get ready for the run Duntov had an experimental camshaft made. Engineering wasn't to keen on it but in December 1955 the car went 163mph helped by Duntov's new camshaft that gave the 307ci V8 275hp. This camshaft also became synonymous with Duntov as it helped the Corvette gain fuel injection. He made modifications to the body that really make it stand out today. With a hat tip to Jaguar he made and fitted the fibreglass tailfin. I'm not sure if these tailfins actually worked, someone might know, but they look cool and gave the driver a good headrest and a bit more rollover protection. The other mods were the single windscreen, passenger side cover, and some lightening of the car. After the run the motor was used in another Corvette that ran 150mph at Daytona Proving Grounds. 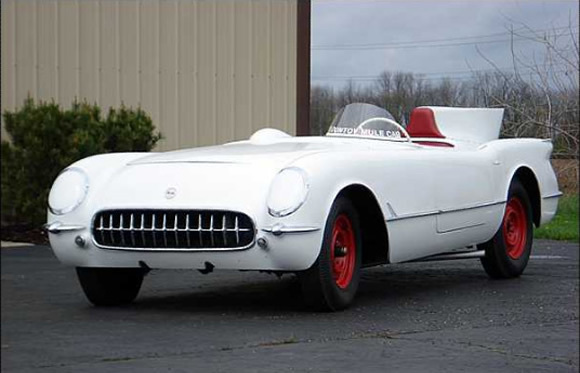 An amazing feat by the standards of the day and it was these feats that made Corvette into the legend it is today.